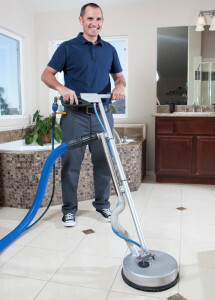 Expert tile cleaning in Ottawa, trust Eco-Pro Home services to restore your tile to it’s former beauty. Beautiful ceramic tile in your home, really adds some serious beauty and practicality to your home décor. The strength and durability of stone, either engineered or natural is very much in demand these days, especially in heavy traffic areas. Stone can last for a very long time, however it is very important that you maintain your hard surfaces with regular maintenance, other wise you will have dull and dirty looking tile and grout. If you spill anything with any kinds of dye in it like coffee or juice, it will stain the grout which is very porous if not properly sealed. When mopping these surfaces, over time it will case the grout lines to have dirt sealed in by the cleaning products and it will always appear dark, unattractive and dirty. No matter what you do it won’t come back to the original color. This is where Eco Pro tile cleaning service comes in. Our expert restoration cleaners will bring back the shine in your tile and be able to remove all off the dirt and grime in your grout lines. It’s pretty incredible how clean and sanitary your tile and grout can be once they are restored and very importantly re-sealed. The sealing of the grout will create a barrier over the porous grout surface to reject any mould, mildew and micro-organisms growth. This way you can keep your home much cleaner and esthetically pleasing. Inquire how long the service provider has been in business, ask if they have references and most importantly of all ask if they are covered by liability insurance. When doing work in your home, accidents can and do happen. The potential for something to get broken or damage is always there and it’s important to know if the unfortunate situation happens to you, that everything will be covered and you can rest easy.